This article takes cue from the news released a few weeks ago which revealed the important goal achieved by Google: 100 billion searches by month. The first result was the impressive spread of this news on web, a phenomenon already noticed by us in some other similar occasions. After all, it was only a piece of news to be released, furthermore of a huge impact, with Google as protagonist, just perfect to capture the readers’ attention. The paradox I would like to underline consists in the fact that the news, almost like a tape duplicated over and over again for hundreds and hundreds of times, began to lose identity copy after copy and in short time reduced itself to a mere synthetic announcement. Unfortunately, as often happens, almost all the “loudspeakers” limited themselves to announce the fact making only some fast comments on the subject, a tam-tam which I personally found banal. In brief, this led me to check some aspects, therefore, indirectly to write this article. The oxymoron subsists in the fact that the news which states the Google’s growth has also produced thousands of clones, so much so if you search today through Google, the three terms “Google 100 billion” you’ll find 1.040.000 potential results. A short-circuit: the news which states that Google has monthly billions of contacts it has billions occurrences, traceable precisely through a Google search and, consequently, causing dozens of millions of clicks from users: billions of clicks which produce millions of clicks, internet is really a self-supporting system. From the numerical point of view I agree with Larry Page, the goals Google can achieve, are above and beyond. With at least 1 billion of potential internet users per day, an efficient engine which is also transnational, an unlimited space at its disposal,… Google could be used by all the people of this planet multiple times per day. With a number of cyber users (smart phone and tablet) which are constantly increasing, I do believe that the goal achieved is significant, but also extremely easy to surpass. We know, based on statistics, that the 93% of the “digital natives” (age group 16-24) uses internet at least once a week (Source EuroStat 2011). Therefore, not only all of us the grown-ups use the search engines, but most probably, the young ones and school-age children use daily these tools too. At this point I wonder where is channeled all this potential? Are we progressively abandoning other search patterns limiting ourselves to use only one tool? 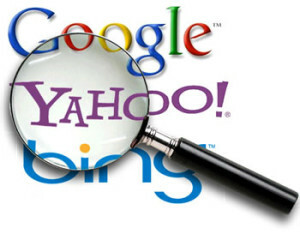 Do we entrust ourselves unconditionally to these search engines? More precisely, how we behave in front of a list of search results? Are we able to choose the most appropriate information? Do we have enough analytical capacity and patience? I searched online some statistic data which could confirm my suppositions. I have to say that my search revealed itself long and less gratifying than I expected. Maybe once again, we find ourselves in front of an oxymoron. I wasn’t able to find, through the main search engines, some reliable and complete statistic information in order to certify the use of it. Internet is not always a transparent universe. I have found however three examples. The first one takes cue from the leak of information given by AOL, an “accidental” mistake, as it is said on web: some tens of millions of search query made by over 600.000 users. This “data pack” is probably the only significant data, in terms of numbers, available on internet. I briefly summarized the gather data in the following table; here are recorded about 20 millions clicks by the data’s sample AOL, I would say a good number (click on the image to read the detail). What shall I say other than I’m truly impressed! In 42.3% of cases we select the first result present on the search list, the second result has a delta of -71.82% with only 11.92% clicks, the third result has 8.44%, while the following results have minimal percentages of selection. I also find interesting the fact that, quantitatively, positions like the 21st, the 31st and the 41th, are not so far-between them, this shows how an insignificant percentage of users is willing to search with attention what they need and therefore to scroll down the list further than the first or the second page. 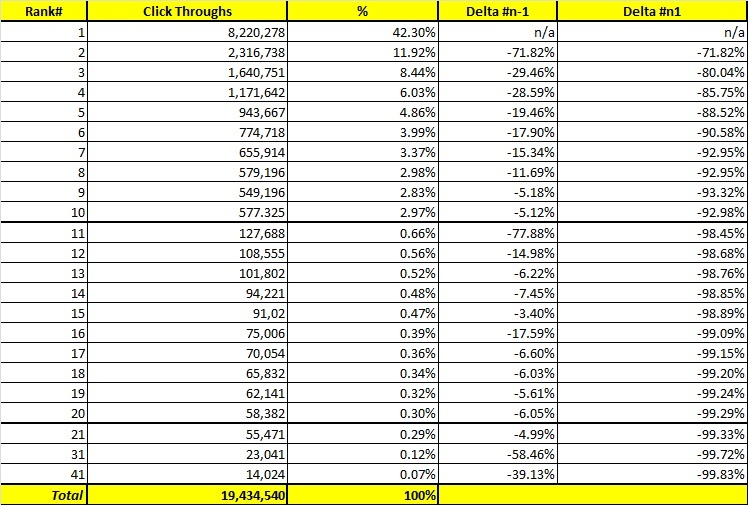 The first page has 89.68% of the clicks, basically 9 out of 10 users remain on the first page. I find fanciful that position n.10 is the only one that doesn’t respect the decreasing trend, obtaining more clicks than the 9th one. It is possible that our eye (or our curiosity) have the tendency to pay much more attention to what is placed on the bottom of the list. These data not only confirm my “feeling” whereby if, after a search, you are not on the first page, the possibilities of being selected are reduced to a minimum, but also concentrates the 62.66% of selections, therefore two-thirds of clicks, on the first three results. The “relevance ranking” of the search engines, or rather the algorithm which determines the position of the search results, seems to guide inexorably our clicks. My second reference source is even more “unusual”; it is about data coming from “BrandSoftech“, a supplier of software solutions for online games and casinos. The example is composed of 5.357.519 clicks of 29.327 different key sentences typed on Google extrapolated from 63 different betting sites. Online are available only the data concerning the first page, therefore relative to the first ten results. It is not clear if the remaining pages capture less than 1% of the clicks or if the study analyses exclusively the assignment of the clicks made on the first page, and only as a consequence of the rounding of two decimal numbers, the example can’t be given of 100%. I personally choose the second hypothesis! 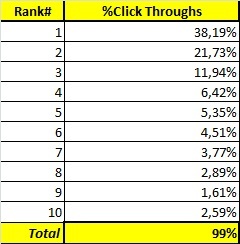 In my opinion, we have an important sample of clicks but only relative to the first ten results. The data are very similar to those proposed on the first table list; in fact they strengthen the role of the first entries of the list. Now the first three entries reach 71.86% and if the percentage report is only between the first ten values it is necessary, in absolute terms, to deduct about 7%. Which is to say that in this case too, it is better to be tenth that ninth; actually in this case the gap between the ninth and the tenth place is even more evident, this certifies the fact that, most probably, we trust much more our visual perceptions, (first and last places), than what we read, or rather, we pay more attention to what is present on certain points of the video screen. If about 2/3 of the users choose one of the three first results proposed by the search engine, I can well understand why Google, as a consequence of a search, proposes always at the top of the list, at most, three sponsored links. It refers to the three links which, statistically, are the most watched. The positions n.1, n.2, and n.3 are those preferred by the cyber users. If it is true that the most of the users “prefer” or “is satisfied” with the first results of the list, we have however, based on the data AOL earlier revealed, about 10% of the users who goes on the second page. So, if from a certain point of view, the phenomenon of the “easy click” on the first three results may result worrisome, it is important to underline that all is not lost yet. There is a category of people capable of selecting what ensues on the following pages and, I would like to add from my experience, more and more skilful audience is able to repeat the same search adding further terms, reducing so the number of occurrences outcome of the same search. These two evolved behaviors cause on web a phenomenon called “Long Tail“, from the expression coined by Chris Anderson. Such phenomenon highlight the 80% of the less popular needs (of any type or kind): basically it allows us (you) to track down that movie, that book, that information “of niche” which is of no interest for the most part of the users and, therefore, hardly traceable without the search engine. In addition to these two sources which, as I mentioned before, are far from institutional, I recommend you to read the research carried out by Cornell University called “Eye-Tracking Analysis of User Behavior in WWW Search“. In this case the number of clicks and the users’ sample are not so important, but a keen attention is being paid to the users’ perception of the page, through the study of “ocular index “, in other words, how long the user observes the page and in what manner. Again, the first three needs have a leading role compare to the others. For the most curious of you, I also recommend the view of the services “Google trends” which monitor the web, proposing daily statistics relative to what is of the great interest for users. Unfortunately, the clicks on the big numbers normally show general information and they end up underlining national popular events such as gossips, football and politics… From the social point of view, I believe web is much more complex and definitely much more receptive than synthesized in these “trends” pages. In conclusion, there is to be both optimistic and pessimistic because web gives us the opportunity to communicate, to express our opinions, to post a video, a photo, material which certifies unequivocally a fact, to look for something very difficult to find present only at the end of the “long tail”,… But, at the same time, we often tend to be satisfied with what web offers us without using completely the tools to our disposal, first of all, our brain. Do not be satisfied with the first three results given by the search engines, you may find something more interesting on the second or the third page.